Test your tolerance for stomach-churning heights by dangling over the edge of the western hemisphere’s tallest freestanding tower, zip lining high above the Las Vegas strip, swimming up to the invisible edge of a skyscraper rooftop swimming pool or taking a tour of Stockholm from atop its architecture. 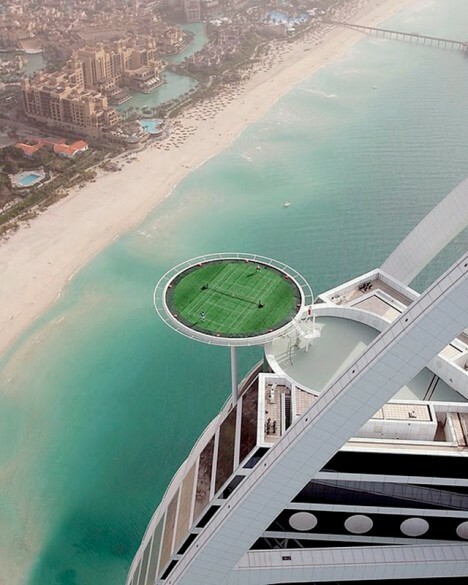 There’s definitely something nerve-wracking about watching a pair of tennis players back up almost all the way to the edge of this sky-high helipad tennis court in Dubai – it’s far too easy to imagine them just sailing right over the safety net. 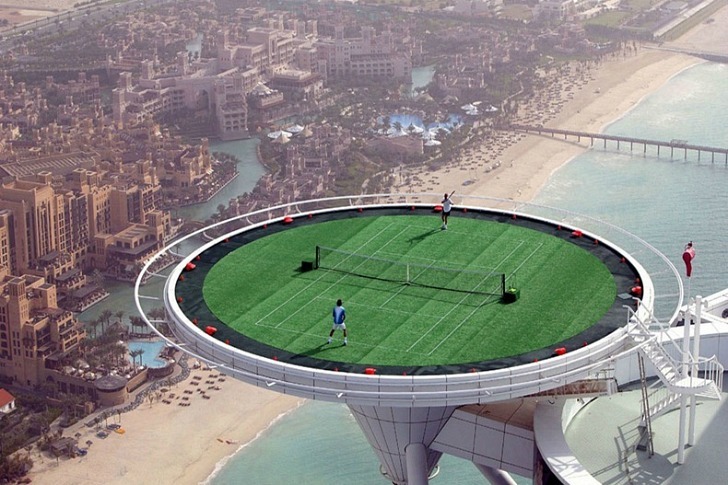 The world’s highest tennis court was a temporary installation atop the Burj al Arab luxury hotel, built in the lead-up to the Dubai Duty Free Men’s Open in 2005. 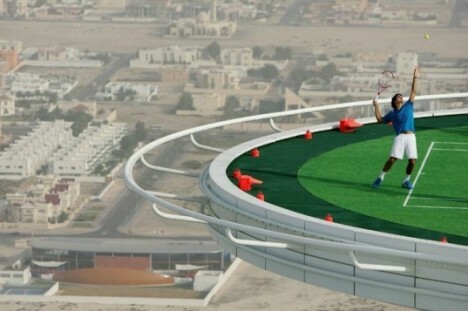 Andre Agassi and Roger Federer were invited to play a game for fun before the real competition began, over 1,000 feet above the ground. Feeling especially adventurous? 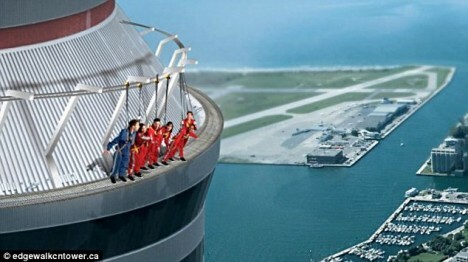 See just how much height you can handle at Toronto’s CN Tower, the tallest freestanding structure in the Western Hemisphere, where the ‘EdgeWalk’ attraction allows you to dangle over the edge of a five-foot ledge that circles around the tower’s roof. Attached to a metal frame with harnesses, thrill-seekers lean out from a five-foot-wide ledge to gaze at the ground 1,168 feet below. 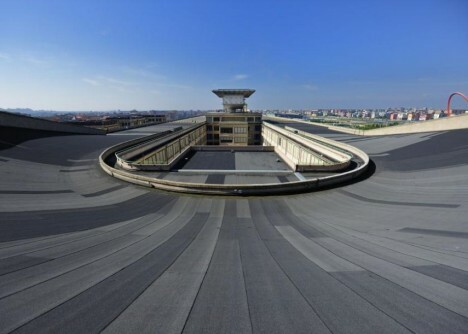 Built on the roof of a Fiat factory that opened in Turin, Italy in 1923, this race track formerly functioned as a place to take freshly-assembled cars on a test run. 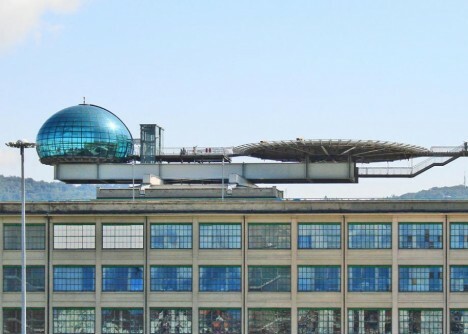 After it closed in 1982, architect Renzo Piano helped transform it into a public space complete with a shopping center, theater, hotel and art gallery as well as a helipad and glassed-in spherical rooftop meeting room. 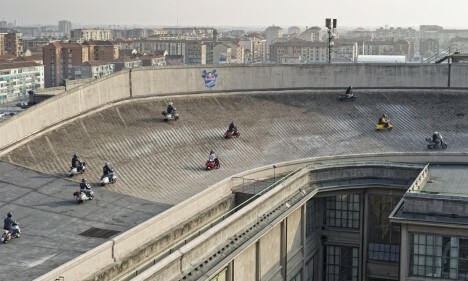 Unfortunately, aside from being featured in a few films, it’s no longer in active use as a race track. You can relax in a traditional English garden, play some mini-golf or even row around in a boat on the rooftop of the Selfridge’s department store in London. 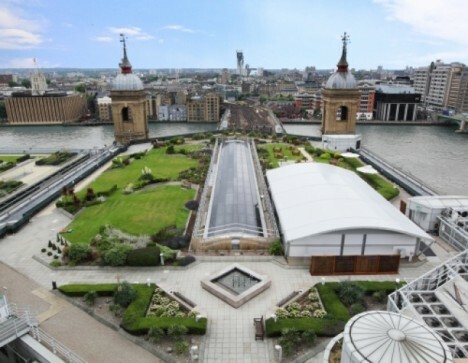 In 2012, the space opened for the first time since its bombing in World War II, prior to which it was a ‘pleasure garden‘ popular for strolling after shopping. 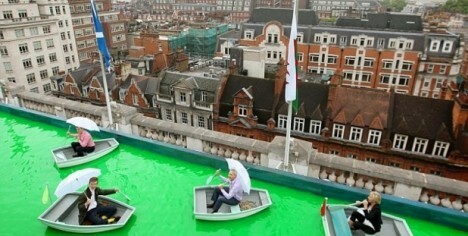 The historic rooftop recreation area now holds special events like the ‘Truvia Voyage of Discovery’ art installation, in which shoppers floated on the surface of a fluorescent green rooftop lake.